While all the other DACs use largely conventional tactics and components, turntable specialist Pro-Ject has adopted an approach beloved of some 'digital retro' enthusiasts, and built a filterless DAC. Now, there's no shame in the company supporting digital formats, for plenty of CD titles have never been released on vinyl. But this move to filterless DAC technology is no 'me too' digital afterthought. The basic idea is to avoid all digital filtering, which is generally thought imperative to avoid aliasing distortion at ultrasonic frequencies, and instead use multi-bit conversion at the native data rate (no up-or oversampling). The claimed benefit of this is the avoidance of 'time smear' due to the long impulse response time of most digital filters. 'Time smear' is a bit of a nebulous concept and its sonic ills are by no means universally acknowledged. 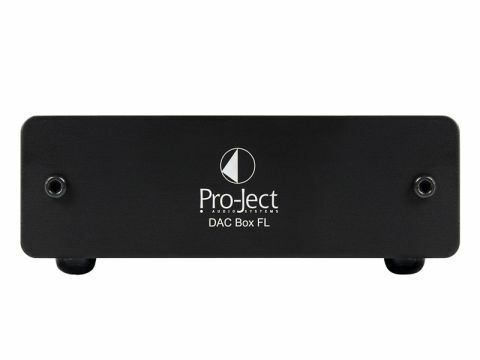 But that doesn't mean the filterless concept is invalid, especially when taken to the extremes Pro-Ject has employed – we can't even see any sign of analogue filtering in the DAC Box FL. The case is identical to that of the super-tiny preamp and power amp in the 'Box' range, as well as the headphone amp and various other units, though in this case it has an unusual amount of free space inside. Four DAC chips are used, concealed beneath a heatsink and connected electrically in parallel. Other components include a digital input receiver and some power supply components. Some form of switch-mode regulation is used, which can lead to the unit emitting a peculiar whistling noise, only audible from very close by. Inputs are both flavours of S/PDIF, though as usual, only one can be used at a time. There are no indicators for anything, so you just have to listen to see if it's working! Not surprisingly, given the design details, this proved to be the most highly characterised DAC in the group and when it's good, it's great. It's at its best when it comes to energetic, lively music making, in which case it's right on the money, full of enthusiasm and very convincing. In fact – and this will probably sell a few units sight unseen – it's so good at that side of things that all our listeners forgot almost completely about the usual hi-fi stuff of balance, detail and so on, and just wrote about how convincing the music-making was. Big scale, wide dynamics, natural sound and suchlike were about the most technical comments to be found. There was just one mention of detail, suggesting it's good, but perhaps not the very best and a couple of mentions of tonal balance, both pointing out that the sound is a little on the bright side though not sufficiently to lapse into harshness. All of which is very welcome news indeed and in no sense to be sniffed at. On the other hand, there is a danger that the enthusiasm can be a little like that of a puppy – enchanting for a while but a little wearing over time. For obvious practical reasons, our blind listening tests aren't very long, but we felt this DAC could become frustrating in the longer term. It's not so much the brightness, though that is persistently noticeable, but more to do with the lack of fine detail, which makes really analytical listening tricky. Then again, one doesn't always want to listen analytically. I think in the end, the fairest comment to make on this DAC is that it can open new windows on recordings, but may not be the only DAC you ever want to own. Used with a CD player of more conventional design, it will be a great alternative to the latter's analogue outputs.